This is the best coffee cake. I love it hot out of the oven, just delicious. It was not good timing when I took it out of the oven and my whole family ran off to be where they had to be for the day….wait…. you are leaving me home alone with this cake???? …oh they returned very quickly! This recipe calls for whole milk, but I only had half and half, it turned out perfect, light and buttery. This is a coffee cake, there isn’t coffee in the recipe, coffee cakes were originally eaten with coffee, but you can eat this cake anytime, just ask my daughter and her friends! 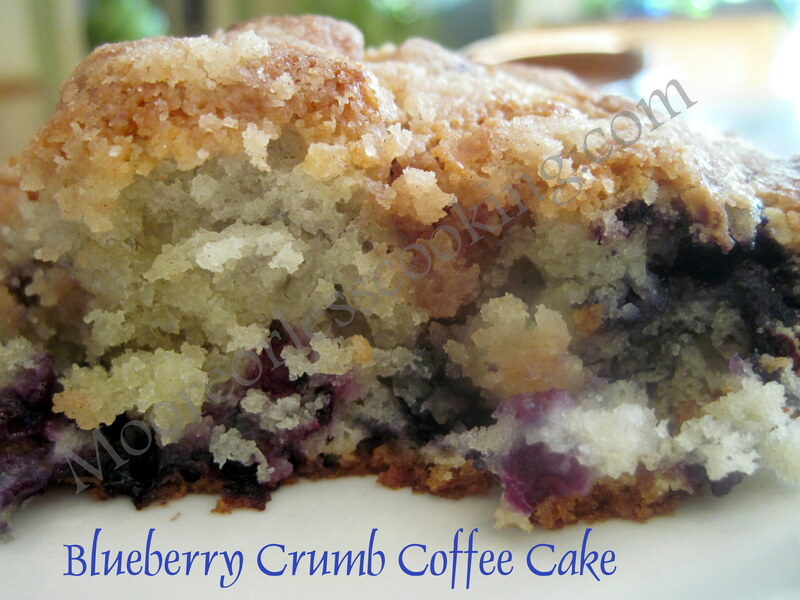 This is such a wonderful coffee cake including delicious blueberries! Add flour mixture and milk alternately to the creamed mixture until totally incorporated. Stir in blueberries until totally incorporated. Grease a 9 x13 inch pan. In a separate bowl, combine topping ingredients and cut together using two knives or a pastry cutter. Sprinkle over the top of the cake . I mail baked goods..usually freeze them, then mail..would this freeze well for mailing? I have never mailed it before, but I have received coffee cakes in the mail, I would make sure it was wrapped really well in saran wrap and foil and perhaps shipped in a tin container. Good Luck! This sounds so good! I can’t wait to try it for my blueberry loving kids!! Thanks! Can you make this the night before and ace it in the oven in the morning? I haven’t tried it before, but I don’t see why not, let me know how it works out. Sounds like you missed ading an ingredient, too bad, it really is a wonderful cake. Looks delish. Have you ever tried making it with any other type of fruit other than Blueberries? I haven’t but would love to make it with cherries too. Peaches would be divine as well! I love blueberry anything. The cake looks heavenly and I adore streusel toppings. Can you use fresh instead of frozen berries? I have a problem with wordpress, when I attach a print button, it doesn’t always work with their program, try Paste and copy. I am happy you enjoyed this cake, it is one of our favorites. I adore blueberries and have some frozen in the freezer, will have to pull them out and get them into this recipe. Thank you!! What a lovely cake Nettie! My family will gobble this up in no time! I love blueberry coffee cake it is simply amazing and yours looks soo good!